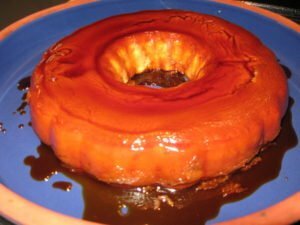 This recipe is for authentic Cuban flan (as made by my mother) and featured in my novel, The Boyfriend of the Month Club. Flan is a delicious custard type desert that is easy to make (although not always easy to flip!). As you can see by this picture, there are tiny cracks in the surface, but I promise you, it does not alter the taste one lick. Combine all the ingredients (except the 2 cups of sugar) in a blender until it is well mixed, then set aside. In a large skillet, melt the 2 cups of sugar over medium/high heat until the sugar completely melts into a syrup. Pour the syrup into a baking pan with a circle in the center (like a Bundt) pan making sure to cover as much of the pan’s surface with the syrup as possible. Let it set for a couple of minutes. Carefully pour the liquid egg mixture into the pan over the set syrup. Place the pan inside a larger pan filled with an inch of water and place the whole thing in a pre-heated 350 degree oven. Bake for about 40-45 minutes until set. Let cool to room temperature, then chill. Before serving, let the chilled flan sit out on the counter for about 30 minutes, then flip it onto a plate, letting all the syrup drip over the custard.